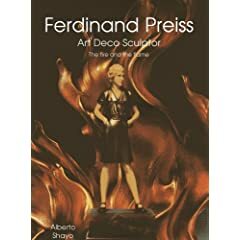 Ferdinand Preiss was one of the greatest sculptors of period Art Deco bronze and ivory works, and a complete biography and amazing color photographs make this new book Ferdinand Preiss: Art Deco Sculptor - The Fire And The Flame a must have for Art Deco lovers. His work sells for huge sums but despite this nobody has attempted to publish a book about him.....until now, and author Alberto Shayo has done a fine job. Ferdinand Preiss was born on February 13, 1882 in Erbach, in the Odenwald part of Germany. When he was 15 years old his parents died, one shortly after the other, and the 6 children were looked after by friends and relatives. Preiss lived with the family of the then famous ivory carver Philipp Willmann, where he was trained to be an ivory carver. In 1901 he left Willmann’s workshop and travelled to Mailand, Rome, and Paris to pursue his craft, earning his living as a modeller. In Baden-Baden he got to know Arthur Kassler who became his companion. With him he founded the company Preiss & Kassler, an ivory-carving business with a workshop in Berlin. In 1907, he married Berliner Margarethe Hilme, and soon afterward his son Harry and his daughter Lucie were born. At first, the model collection of the new company consisted of small ivory carvings, including statuettes of children and carvings whose motifs were mostly oriented towards classical ideals. From 1910 onward, the first carvings which combined bronze with ivory were produced. The casting was done by the company Gladenbeck in Berlin, and by the time the World War I broke out in 1914 the company had 6 employees, all outstanding ivory carvers from Erbach. Immediately after the end of the war, Preiss and Kassler built up the business again which would reach its pinnacle during the 1920s. Preiss was the artistic director whereas Kassler devoted himself to the commercial side of the business. They specialized in Art Deco style cabinet sculptures which combined ivory with painted bronze and which were mounted on plinths made of onyx, marble, and sometimes also on mantelpiece clocks or lampstands. The models, which were almost all designed by Ferdinand Preiss, were produced in limited editions. A large proportion of the production was exported to England and the USA. The company Preiss & Kassler existed until 1943 when Ferdinand Preiss died that year at the age of 61 from a brain tumor. The workshop with the stock of samples in Ritterstraße in Berlin completely burned down in 1945, just before the end of the war during a bomb attack. Ferdinand Preiss is regarded as one of the leading ivory carvers of the Art Deco scene of the 1920s and 1930s, and his bronze and ivory carvings are among the most costly in the world. 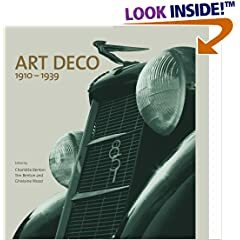 This book captures the story of this fascinating Art Deco artist and vividly photographs his work that so reflects the fun loving spirit of the 1920s and 1930s.